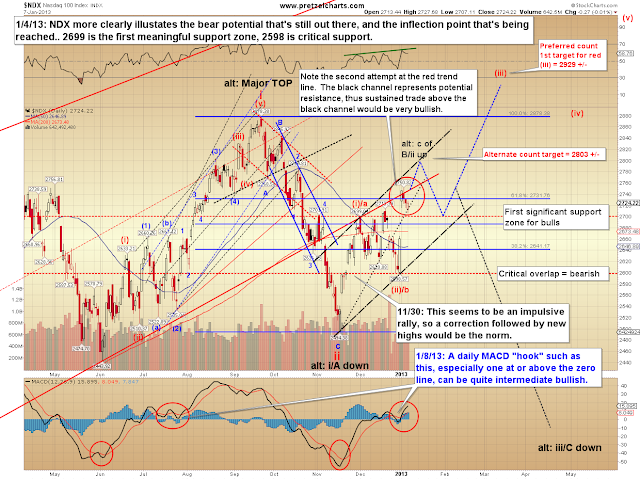 Friday's update noted that the market was approaching an inflection point, but expected that the S&P 500 (SPX) had at least one more fourth wave correction and fifth wave higher still to come, which the market fulfilled. The short-term charts are in a bit of flux at the moment; so I'll discuss the short-term later, but want to focus on the long-term in this update. 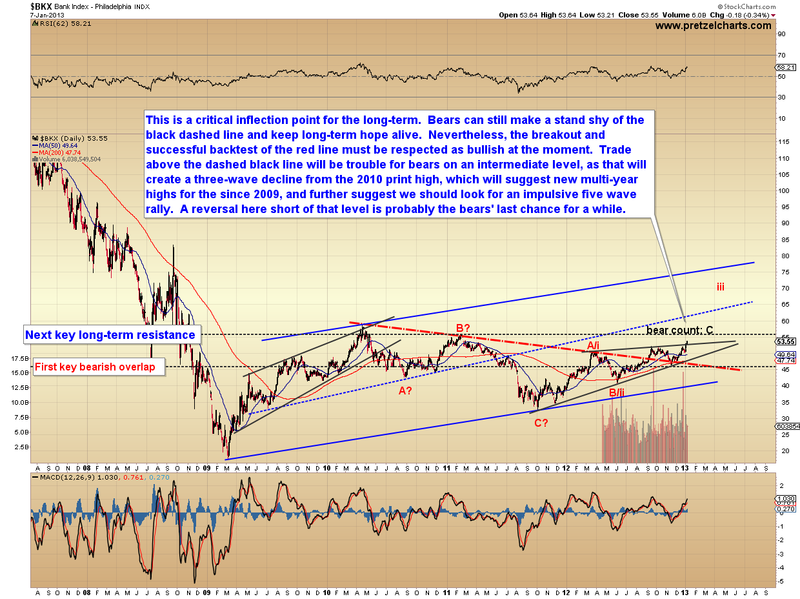 In most recent updates, I've focused on the long-term bull potential, which I'm still favoring. I should probably make it clear that I'm not suddenly flipping to the bear side here, but nevertheless, I do want to bring a bit more balance to that discussion. I want to start off with a chart that does a reasonable job of highlighting the long-term importance of the current inflection point. The Philadelphia Bank Index (BKX) has broken out and back-tested a bullish basing pattern, and is now in a critical long-term resistance inflection zone. The problem for bears is that this chart simply isn't bearish -- it has bearish potential; but it's important to understand the difference. 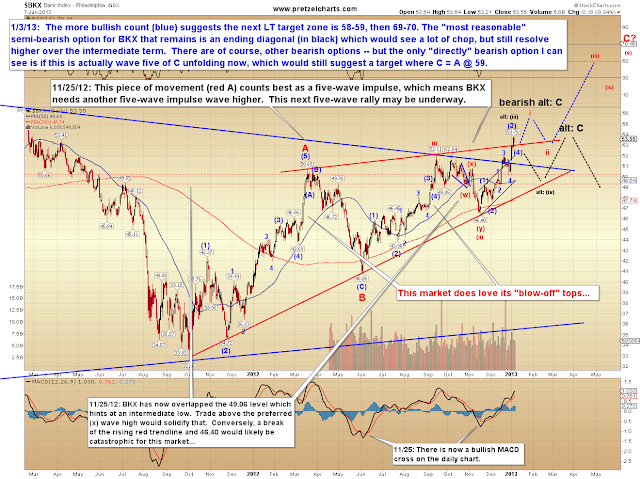 The chart below zooms in a bit on BKX and discusses the likely wave structures and targets. While BKX has loved blow-off tops of late, I have to favor the more traditional market pattern, which is that the strongest waves usually fall closer to the middle of the pattern -- thus suggesting further upside is still out there after the next correction. Finally, the updated SPX chart. 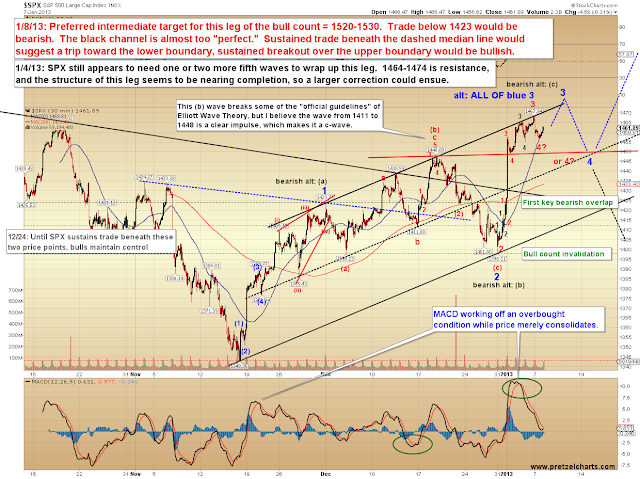 There may still be another small fourth and fifth wave left to wrap up, but this is where the short-term becomes a bit ambiguous. 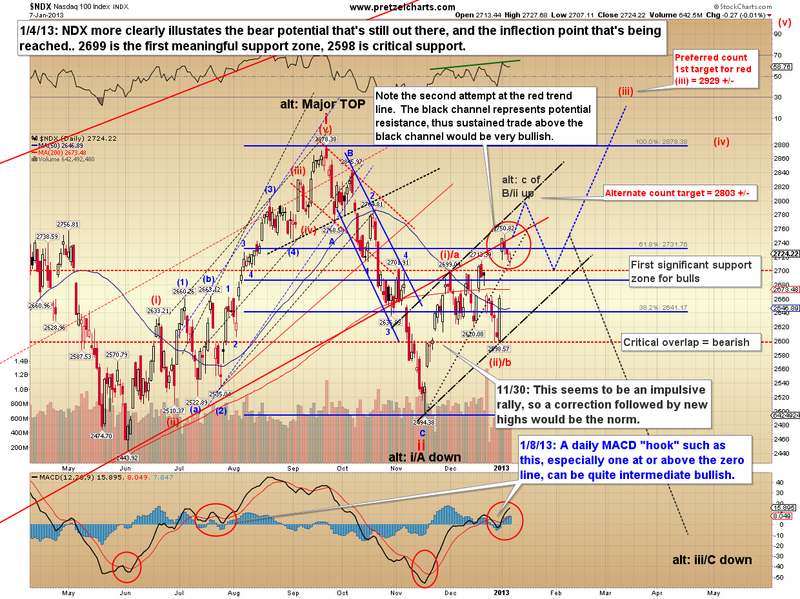 I remain in favor of an intermediate bullish resolution, but as I noted on Friday, this is not a time for bulls to be complacent, given the gravity of the current higher-degree inflection point. The chart notes some key levels and signals to watch. In conclusion, it still appears more likely that the bulls will continue to own the intermediate term, but the bears definitely aren't out of the running yet. 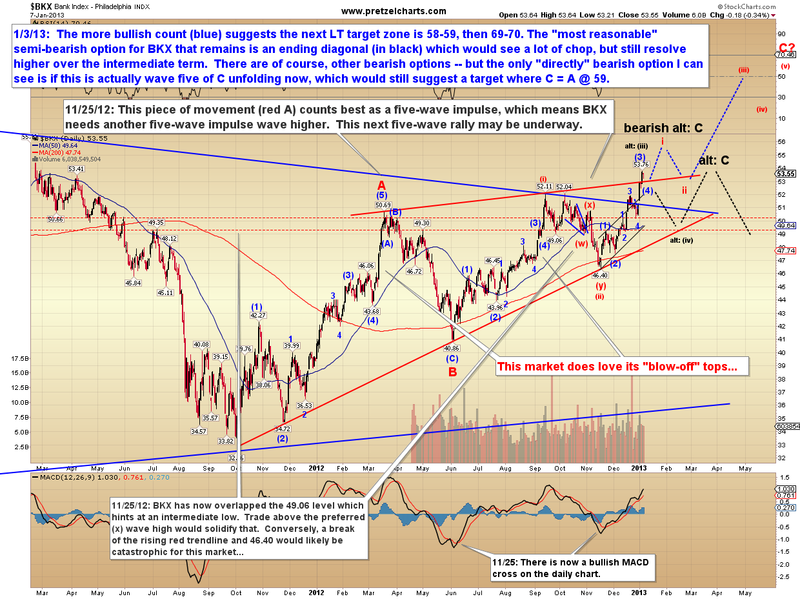 I do feel that bears need to make a stand in the fairly near future, or risk a long-term loss of control. I'm working on an article that discusses a bit more about the fundamental problems facing the governments of the world, and why being a long-term bull is challenging for most thinking people. I hope to have it ready for the next update, but I hoped that two updates ago... In the meantime, trade safe. Reprinted by Permission; Copyright 2012, Minyanville Media, Inc.